The 'Fair Sailing Tall Boy' memorial on Lamar Blvd. “The thing I find really powerful about it: It’s this person, whoever did this – Mom, Dad, sister – that’s immortalizing this kid’s life, and it’s a life that had really just begun,” Oliver says. She asked us to investigate the story behind the memorial for our ATXplained project. There’s not a lot to go on from the memorial itself. No one signed it. 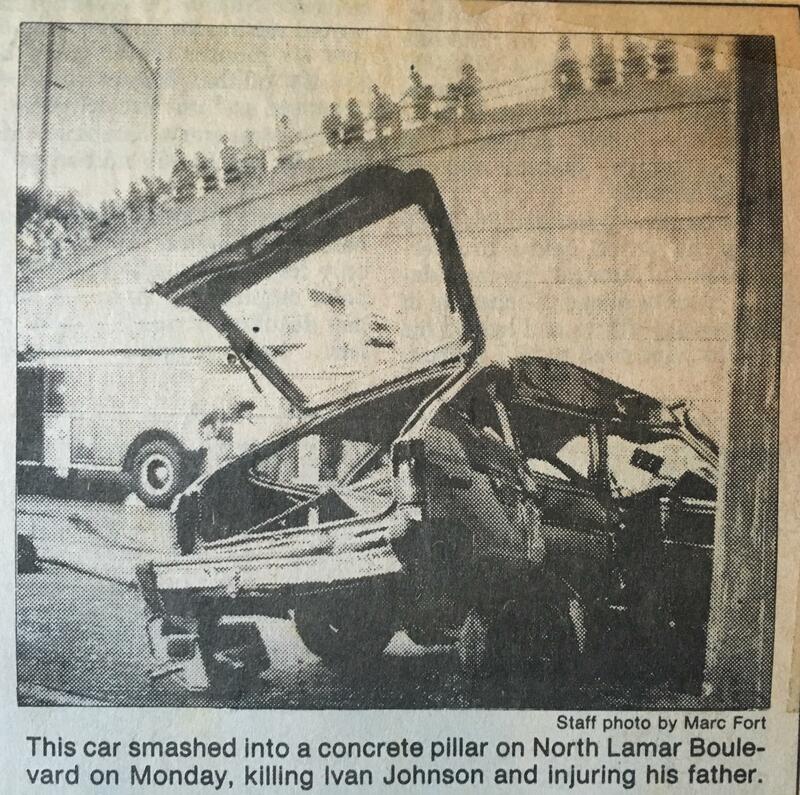 And 1989, when Ivan apparently died, was a long time ago – especially in Austin. But with some Googling, I tracked down Ivan’s story. Bruce David Johnson, Jr. at his South Austin home. Bruce David Johnson wipes the dust off a photo of Ivan that sits on his bookshelf. Bruce David is Ivan’s dad. His beard, now white, hangs over the front of his overalls. Ivan was a handsome kid. Tall and thin, sporting an unmistakable '80s haircut in the photo. 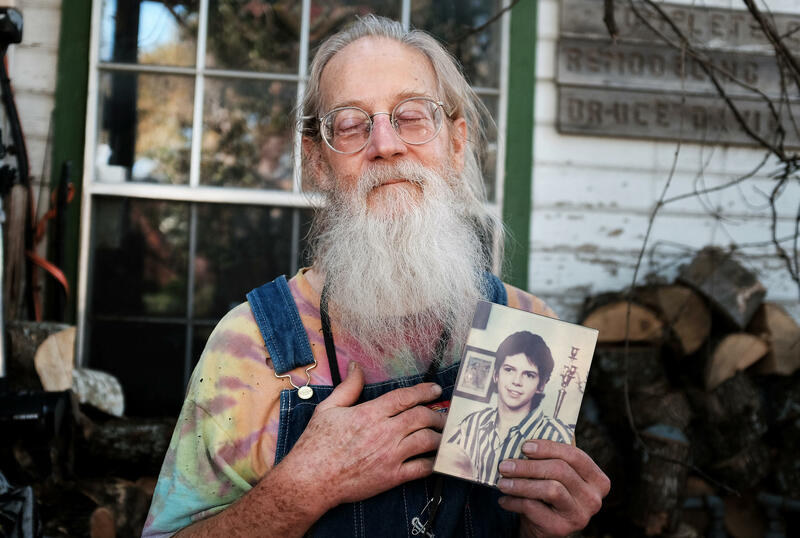 Bruce David keeps file cabinets full of journals chronicling his entire life – and Ivan's, starting from his birth on November 8, 1971. Mary and Bruce David didn’t stay together for long after Ivan was born. Mary Boyd holds a photo of her son, Ivan. 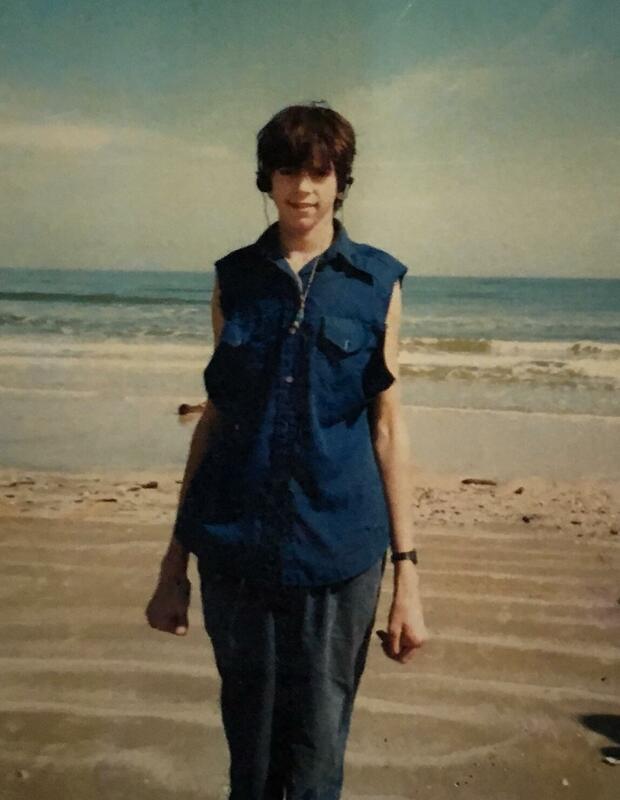 Ivan was born with something called Marfan Syndrome. Ivan was homeschooled for a while before going back to public school at Austin High School. But Mary says he didn’t seem to look too far into the future. Bruce David Johnson's car after the crash. Photo of the print edition of the Austin American-Statesman from July 18, 1989. It was Monday, July 17, 1989. Ivan was 17 years old. His truck had broken down. Bruce David had towed the truck back to his house in South Austin to fix it. Then, he and Ivan headed back to North Austin to drop Ivan off at Mary's. They were headed up Lamar, just over the bridge across Town Lake. Meantime, another driver, who had been at Barton Springs drinking beer with a friend, was speeding up Lamar, too. According to the police report, the drunk driver was weaving around slower cars, going over the speed limit, and hit Bruce David's car in the back right side. The impact pushed Bruce David's car up onto the median and smashed the passenger side into the support column on the railroad bridge. “[Ivan's] head hit that column. He was killed instantly,” says Mary. Mary, of course, didn’t know any of this yet. Bruce David was badly injured and in a coma that would last several days. That night, Mary was getting worried when she hadn’t heard from Ivan. She called Bruce David’s house, and someone there told her there had been an accident and she should call the hospital. So she called the Emergency Room. Eventually, she was put on the phone with Bruce David’s wife, Ivan’s stepmom. Mary says the pain was beyond anything she could fathom. Ivan Johnson as a young boy. Mary says a kind of insanity set in after Ivan’s death. It changed her. She couldn’t worry about all the little stuff most of us agonize over. The grief, she says, was written on her face. Many of her friends abandoned her. There were good things, though. That year, she would meet the man who she would later marry. It was November 1989, right around what would have been Ivan’s 18th birthday, that Mary started to think about a memorial. "I was thinking about what should I do, and this friend suggested a heart with ivy leaves…because 'Ivy' was one of his nicknames,” she says. She knew right where to put it: under the train bridge, the place where Ivan died. Beyond it being the place where he died, Mary also want to cover up a piece of graffiti that was on the pillar. 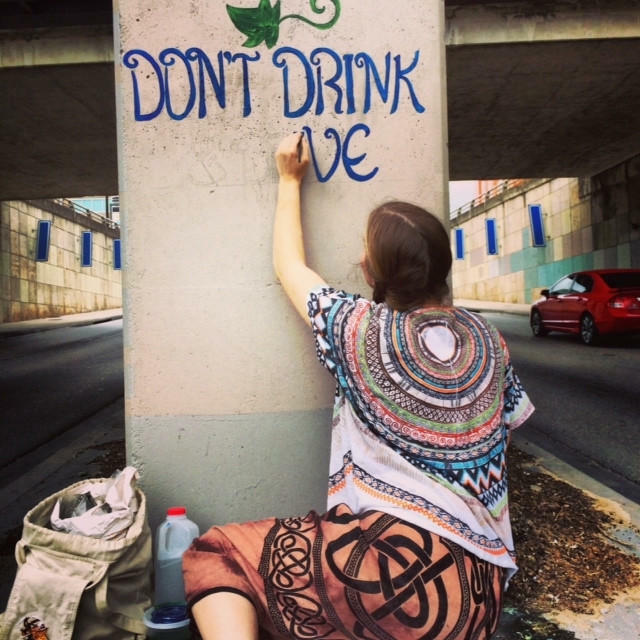 So she made some stencils, recruited a friend to help distract the police (if needed) and headed out to the bridge. “I put up the first stencil and did all the red, and I was like crying and I’m like, ‘Is this red enough?’ and [her friend] goes ‘Yeah, that’s very red,’" recalls Mary. Mary and her friend actually ended up getting arrested, but the memorial was finished. "‘Fair sailing’ is from an old Austin jug band song about Amelia Earhart," Mary explains. "Ivan wanted to fly. He wanted to fly ultralights. He never did." And he was tall – 6' 3" – so that's the "tall boy" part. Family photo of Ivan Garth Johnson. What about "Don't drink and drive you might kill someone's kid"? Every year, Bruce David makes a heart out of cedar with the number of years since Ivan’s death – and sets it at the base of the pillar. This year's will be number 27. The memorial has been defaced a few times over the years. Mary fixed it once back in the 1990s. Then a couple years ago, somebody painted over the bottom part of the memorial. Mary intended to fix it, but then she found out someone else had already done so. Amberly Worley restoring the memorial in 2014. Stephanie recruited her friend Amberly Worley to restore the memorial. “I’m glad that we could kind of take on that burden for [Mary]," Stephanie says. For her part, Mary Boyd is happy that others – people she doesn't even know – are looking out for Ivan’s memory, too. Ivan Garth Johnson would have turned 45 years old this November.